I'm a relentless practical joker. When I ask my fellow content creators to watch a movie on my new "cardboard box", they think I'm up to something. In reality, this piece of cardboard is a compelling new "screen", one that can turn your mobile phone into a virtual reality portal where the audio and video surround the viewer. No kidding! With U_News, our interactive newscast that used live group video, I couldn't help but think the media business was reaching the limits of telepresence or what I call "Human Media", media of the senses that simulates living, breathing interactions. How could it get any more life-like than being able to read the news and see your audience's facial expressions in real time? Then along comes devices that easily play Stereoscopic 3D video in a compelling way. #humanmedia is now even more human. Head Mounted Displays (HMDs) and even boxes like Google Cardboard transport you to a place where in the words of Mogul Peter Gruber at #NAB2015, you are "a participant and not a passenger." 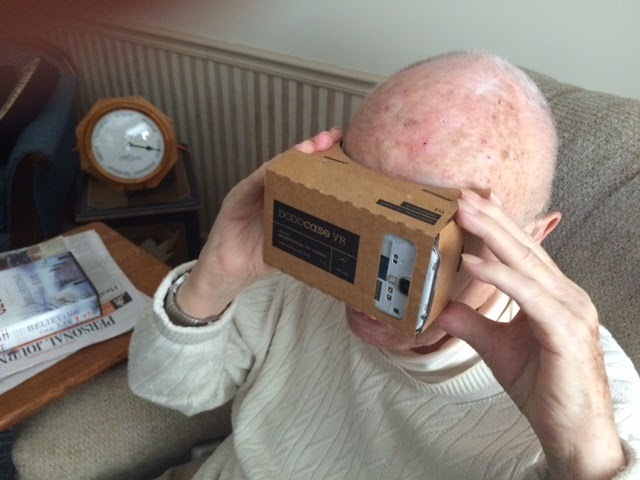 Recently, I gave a World War II veteran his first VR experience and watched his reaction. It was as if he didn't just view the video, he felt it. In the words of many in VR, we are at the Lascaux Cave stage of an entirely new form of Storytelling. Arthur Van Hoff, CEO of Jaunt VR, says our "brains are now virtual reality machines." According to Hoff, video rendering in VR is 20-1 like back in the film days. No longer do we have to rely on a frame to direct a viewer's attention, the story is all around us. To get an idea of the kind of 360 Storytelling VR requires, check out the editing software Cosmo Scharf and his crew at Visionary VR have cooked up. Makes my Avid Media Composer look like a Tinker Toy. What challenges are you facing telling VR stories?